Having been involved in the field of Photobiomodulation(Low Level Laser Therapy) for many years, we are often contacted by pet owners both in the Boston area and internationally. We frequently write and review articles, read journals, assess possible research projects and consult in all phases of using light to treat medical conditions in animals as well as people. When we find something worthwhile to report, we like to bring it to your attention in the hope that you can share the information with others for whom it might be releveant. In the upcoming issue of the journal “Photomedicine and Laser Surgery” new research is cited which shows improvement in cerebral (brain) blood flow and cognitive functioning in veterans with Traumatic Brain Injury when treated with light . Brain injury in the world’s population is one of the top medical problems that exists. Traumatic Brain Injury, Alzheimer Disease and other Dementia, Post Traumatic Stress Disorder, Chronic Traumatic Brain Disease are but of some of the diseases that have shown a positive benefit when treated with Photobiomodulation. 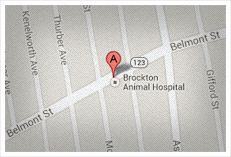 The Brockton Animal Hospital will continue to aid in the expansion of treatment opportunities for Low Level Laser Therapy in the Boston area and beyond.